When state and local governments bid for corporate investment, working people lose. It is as simple as that. And Foxconn’s on-again, off-again, and on-again shrinking investment in Wisconsin is a case in point. In July 2017 Foxconn announced, at the White House, its agreement to spend $10 billion to build a factory in Wisconsin to produce flat-panel display screens for televisions and other consumer electronics, creating 13,000 manufacturing jobs within six years. In return, the state of Wisconsin offered the company $3 billion in subsidies. The agreement was celebrated by then Wisconsin governor Scott Walker and, of course, lauded by President Trump. However, in January 2019, the special assistant to the president of Foxconn announced that “In Wisconsin we’re not building a factory. You can’t use a factory to view our Wisconsin investment.” The reason, according to the special assistant, was that Foxconn decided that it couldn’t compete in the U.S. TV market using U.S. labor to build LCD panels. As for jobs, the company has already fallen short on its employment promises. It pledged to create 260 jobs in 2018 but added only 178. It also promised to employ 5,200 workers by the end of 2020, but now estimates that the total will likely be closer to 1,000. And most of the future hires will be engaged in research and development, not manufacturing. By December 2017, the public cost had grown to include $764 million in new tax incentives from local governments in Racine County, which is just 40 minutes south of Milwaukee where the plant was to be located. Other additions included $164 million for road and highway connections built to service the plant, plus $140 million for a new electric transmission line to Foxconn that would be paid for by all 5 million ratepayers of the public utility We Energies. With other small costs added, the total Foxconn subsidy hit $4.1 billion—a stunning $1,774 per household in Wisconsin. The original plan specified that the subsidy would be given out in increments as investments were made and jobs created. It remains to be seen how the state will respond to Foxconn’s retrenchment. But the additional $1.1 billion highlighted above will cost the public regardless of what Foxconn does, since local governments have already begun building the infrastructure that Foxconn wanted. Those are real outlays that will come at the expense of other, far more critical social programs. And then there are the families who lost their homes when eminent domain was used to seize their properties to prepare the land for Foxconn’s proposed factory. Not surprisingly, Foxconn’s announcement that it was walking back its commitment has generated a lot of anger in Wisconsin. And bad press for President Trump. 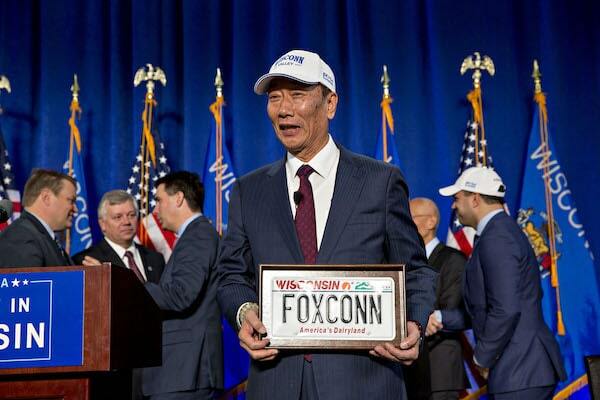 And so, after a January 2019 phone exchange between President Trump and Foxconn chairman Terry Gou, the company announced that it will indeed build a factory in Wisconsin, just a smaller one than originally promised. I think we all know how this will work out. Foxconn promised a $30 million factory employing 500 workers in Harrisburg, Pennsylvania, in 2013. The plant was never built, not a single job was created. That same year, the company signed a letter of intent to invest up to $1 billion in Indonesia. Nothing came of it. Foxconn announced it would invest $5 billion and create 50,000 jobs over five years in India as part of an ambitious expansion in 2014. The investment amounted to a small fraction of that, according to The Washington Post’s Todd Frankel. Foxconn committed to a $5 billion investment in Vietnam in 2007, and $10 billion in Brazil in 2011. The company made its first major foray in Vietnam only last year. In Brazil, Foxconn has an iPhone factory, but its investment has fallen far short of promises. Foxconn recently laid off 60,000 workers, more than 50 percent of its workforce at its IPhone 6 factory in Kushan, China, replacing them with robots that Foxconn produces. Even more importantly, the deal was a stinker for working people in Wisconsin. Wisconsin’s Legislative Fiscal Bureau, after examining the initial agreement, concluded that that the state wouldn’t break even on its investment until 2043—and that was an absolute best-case scenario. The agreement was announced in July 2017. Less than one year later, in June 2018, Foxconn announced a change to its plan. Instead of a Generation 10.5 plant producing 10-foot by 11-foot panels for 75-inch TV screens, Foxconn said it would build a Generation 6 plant that only produced 5-foot by 6-foot panels. The smaller plant would require only about one-third the initially promised investment. Then, in late August, Foxconn announced yet another change, when its spokesperson, Louis Woo, told the Journal Times that even the Gen 6 panels might not be manufactured in Racine for long. “We are not really interested in television,” Woo told the newspaper. Is reconsidering plans to make advanced liquid crystal display panels at a $10 billion Wisconsin campus, and said it intends to hire mostly engineers and researchers rather than the manufacturing workforce the project originally promised. Rather than a focus on LCD manufacturing, Foxconn wants to create a “technology hub” in Wisconsin that would largely consist of research facilities along with packaging and assembly operations, Woo said. It would also produce specialized tech products for industrial, healthcare, and professional applications, he added. Finally, as noted above, after a phone conversation between President Trump and Chairman Gou, some kind of factory is back in Foxconn’s plans. But for how long? In retrospect, it’s clear that Walker had a strong hand to play in negotiations with Foxconn. The company had to locate in a Great Lakes state because of the huge amount of water needed to clean the glass used in manufacturing LCD screens. And no other Great Lakes state came close to offering the $4.1 billion Foxconn is getting. Michigan came the closest, offering $2.3 billion, but it was partly a tax subsidy rather than cash. When the Legislative Fiscal Bureau did its evaluation of the deal, it concluded, as noted above, that it would take until 2043 for taxpayers to recoup the subsidy. But that was based on a $3 billion subsidy. At $4.1 billion, the current amount, the date gets pushed back to 2050. And again, that assumes that all goes according to the initial plan. In short, there is no good outcome here for the people of Wisconsin. Given the enormous social and environmental costs associated with this project, Wisconsin is probably better off if it can cancel the deal the previous governor made with Foxconn. Most importantly, one hopes that the Foxconn fiasco will solidify popular understandings that it never pays to compete for corporate investment with tax cuts and public subsidies.